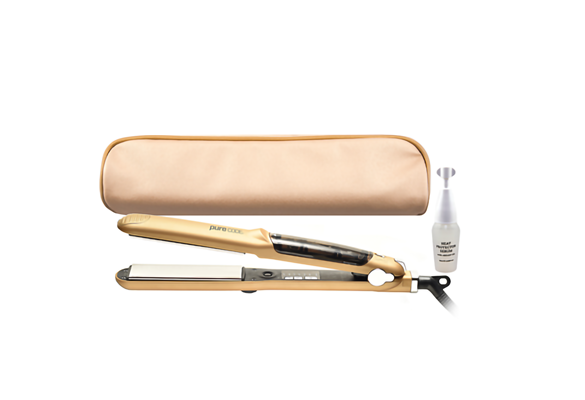 1 ¼” Titanium Built Flat Iron with Argan Serum Infusion Technology. 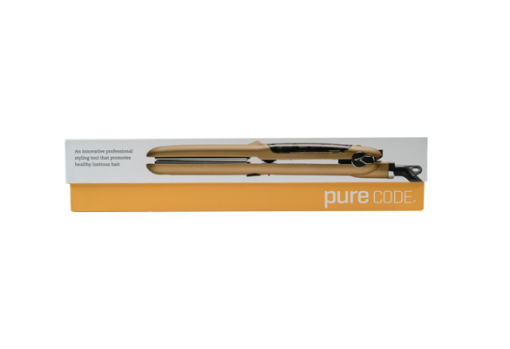 Unlike other heated tools, PURECODE’s Infusion Technology works with your hair, not against it. 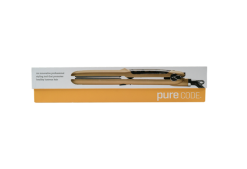 While styling hair, PURECODE Heat Protector Serum flows through the plates to infuse a unique blend of ingredients (including Argan Oil and Vitamin E) to protect hair, while gently adding shine. 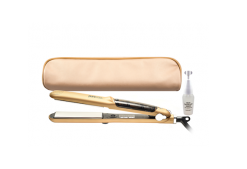 Designed specifically for professional stylists, PURECODE’s serum has been specially designed to work in conjunction with the vapor iron for optimum results day after day, week after week. In addition, Titanium Infuse Pro® has a wide temperature range, and reaches and maintains consistent heat at 450° degrees. This is one of the highest temperatures available on the market. Enjoy doing minimal passes from the top of the head all the way to the ends with this powerful tool. 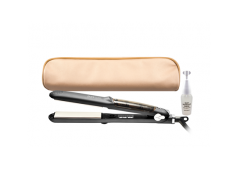 Whether you’re going for a sleek, straight look or smooth, bouncy waves, it’s easy to get the results you want. And the serum’s soft, appealing fragrance makes the process a pleasure. Available in Shimmering Matte Gold and Classic Salon Black, the Titanium Infuse Pro® represents the values PURECODE® brings to the hair care market—Creativity, Design, Quality and Advanced Technology, for immediate, long-lasting beautiful results, and healthier hair over time. All PURECODE® products are made with the highest quality in mind and are tested for quality assurance. However, in the event that the product fails due to being defective, PURECODE™ will replace the product at no charge with an identical or similar product. Your product comes with a one year limited manufacturer’s warranty starting from date of purchase. Only products purchased through authorized dealers are covered under the warranty. This warranty covers manufacturer defects only and not damage due to misuse or improper care of the product. When using the product in the infusion setting be sure to use “PURECODE® HEAT PROTECTOR SERUM”. USING ANY OTHER PRODUCT OTHER THAN WATER WILL VOID THE WARRANTY. This warranty is only valid on genuine PURECODE™ products. Please do not attempt to repair or service the product. This product has no serviceable parts; any attempt to repair or service the product will void the products warranty. To arrange Warranty Service, fill out the form located here Please send all exchanges, including the RMA# from the form, to the following address: Attn: Warranty Claim PURECODE USA Inc. 2139 Route 35 North, Suite 6 Holmdel, NJ 07733 Please secure packages, to protect against loss or damages. Please use a tracking method.